[AESTHETICALLY PLEASING IPHONE 7 CASE] Premium polycarbonate (PC) frame with unique textured design that adds extra grip to your Apple iPhone 7. [DUAL-LAYER PROTECTION WITH RAISED BEZEL] Dual layer polycarbonate (PC) and thermoplastic polyurethane (TPU) with raised bezel protects your iPhone 7 from unwanted scratches and bumps. [CORNERGUARD TM TECHNOLOGY] Built with CornerGuard technology, it ensures that all four corners of the case absorb and disperses force from drops. Vena vAllure is designed using high-quality polycarbonate (PC) with metallic finishing to provide the exclusive premium look. The unique textured design on the side adds extra grip to your Apple iPhone 7. The slim dual-layer design of Vena vAllure features polycarbonate (PC) frame and thermoplastic polyurethane (TPU) core, providing your phone mild to moderate drop and scratch protection, perfect for everyday use. Raised bezel keeps the screen and camera above the surface when placed face down, keeping the screen and camera clean and scratch-free. The high-quality shock absorbent thermoplastic polyurethane (TPU) does not stretch out over time. 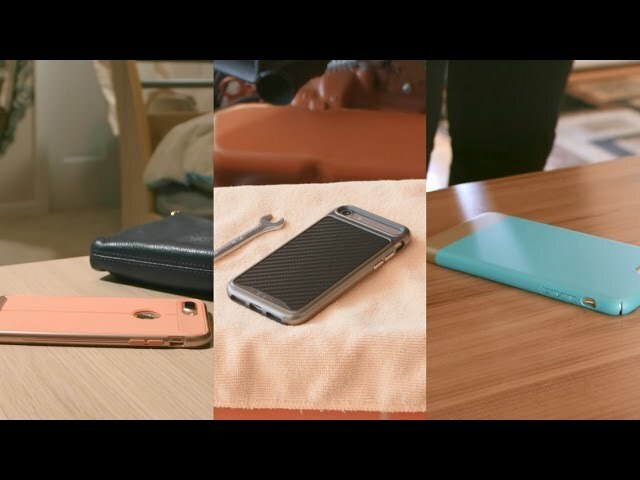 With CornerGuard TM technology and unique pattern, Vena vAllure protects your Apple iPhone 7 and disperses the force from shock and impact through the TPU case. 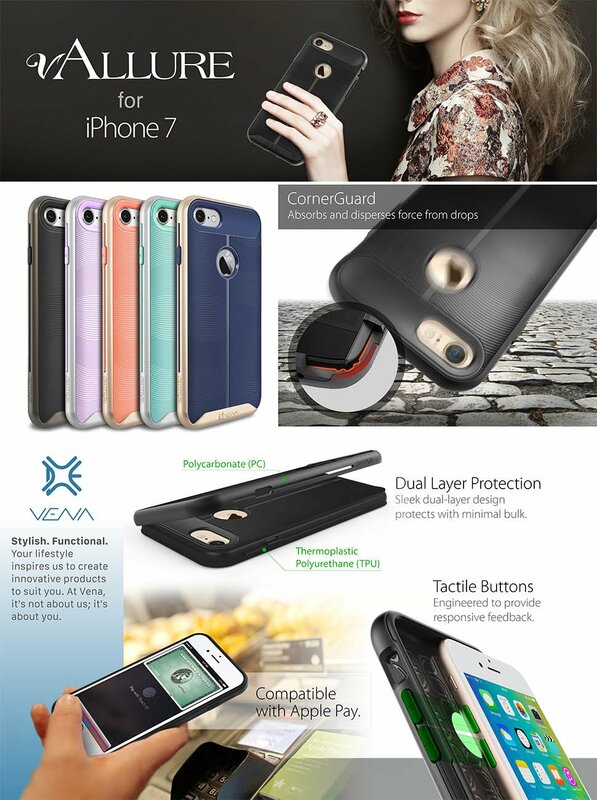 Vena vAllure is designed with precision cut-outs to suit the Apple iPhone 7 and provides effortless access to all ports, buttons, and features. The beveled power and volume buttons are crafted to maintain the same great tactile feedback from your phone's buttons. 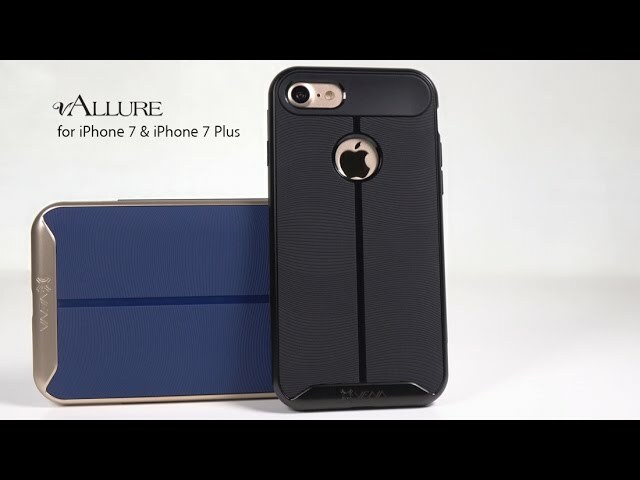 vAllure is exclusively designed, and an extremely well thought-out case that is born from a collaborative effort from our highly experienced and professional teams in U.S. and South Korea. Your Vena product is included with a limited lifetime warranty. At Vena, we use our products as you do. We are continuously striving to improve the quality of every product with Vena name. If you are not completely satisfied with your purchase, simply reach out to us and we will replace or refund your purchase. Visit the Vena website for more details. It's a nice case and I've received a lot of compliments on it. I haven't dropped my phone, so I'm not sure how much protection the case would offer in that sense. It does make it easy to grip, though. Pretty, simple, lightweight and the right price. The case fits perfect, it is just rubbery enough to help me hold on to the phone. If there was any negative it would be the silent switch on left side of phone - a little difficult to reach it, but not an issue really. And of course the price was great - you cannot beat Amazon - ever!! Very attractive case. Easy to hold in your hand because the textured waves at the back prevent it slipping. I LOVE this case!❤️ I purchased the lavender/silver Vena iPhone case. It's cute and fits PERFECTLY on my Rose Gold iPhone 7. The easy grip is great. It doesn't make my phone look bulky and I've gotten a TON of compliments! 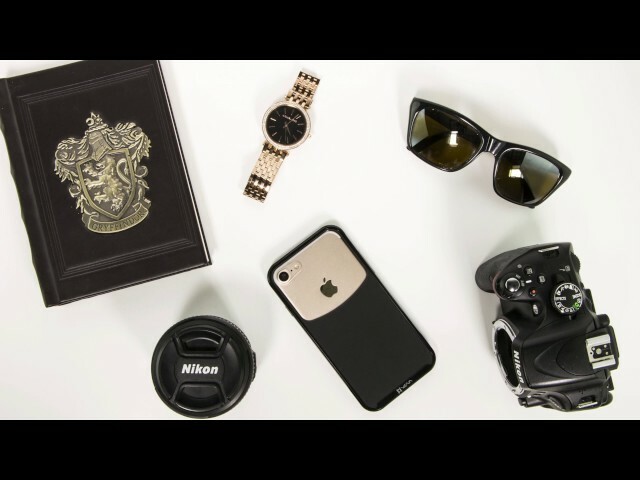 Solid Case Review by Logan K.
Awesome case. Fits well, very light and protects against drops. Looks great too. Sweet looking case, but it did not adequately perform its primary function of protection, and so when my wife dropped it from a height of 3.5 feet onto the concrete, the screen on her 2 month old iPhone 7 shattered. This is the first broken screen our family has suffered and we have had more then 10 iPhones over the last 4-5 years and they have all been dropped, but none of them ever broke. Also, the phone did have a screen protector on it. When you compare this case to other brands, the ridge that supposedly keeps the screen from reaching a surface if dropped or flipped over is not nearly as high, and that's likely why it failed. Lesson learned. An expensive lesson. Also, another observation we have is that this specific case was filthy after two months. The ridges in the case capture a lot of dirt. So be prepared to clean the case often. Same color as it shows. Fit well to the button and easy to take off to clean. Not bulky and has one mm raise on edge to protect screen. I wish it could raise a bit more to give more protection. I love this case. It is durable and very cute.